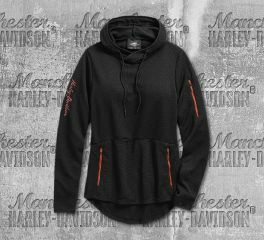 Warm and cozy, yet totally Harley, these women's pullover sweatshirts are perfect for cooler night rides or just lounging at home planning the next one. 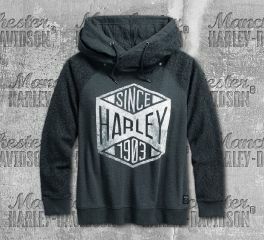 Harley-Davidson® Women's Retro Varsity Pullover Sweatshirt is made from super smooth French fabric. 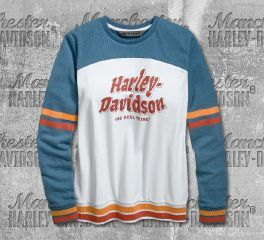 It features a colourblock design, vintage font on Harley-Davidson® script, and striped finish. 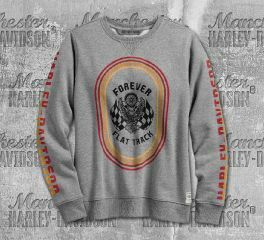 Harley-Davidson® Women's Forever Flat Track Pullover Sweatshirt is made from 60% cotton, 40% polyester fleece. It features a printed graphics, and woven label, rib knit neckline, cuffs and waist. Perfect pair on your jeans or leggings. 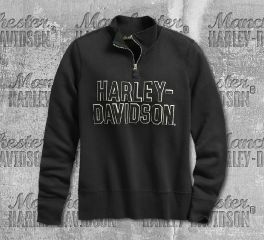 Harley-Davidson® Women's Felt Letter 1/4-Zip Pullover is made from 100% cotton french terry, washed for softness. The garment dyed with enzyme pigment spray for faded look. It features a 1/4 zipper front, an embroidered patch, two layer appliqué lettering, rib knit collar, cuff and waist. 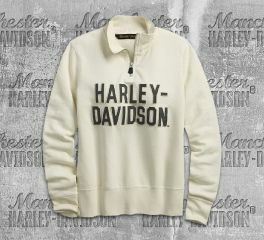 Harley-Davidson® Women's Felt Letter 1/4-Zip Pullover is made from 100% cotton french terry, washed for softness. The garment is dyed and pigment spray for faded look. It features an embroidered patch, two layer felt appliqué lettering, rib knit collar, cuffs and waist. Cool weather? Snuggle up in the cozy Long Live Collegiate Pullover Hoodie. This fleece layer includes striped ringer trim for a sporty, vintage look. Style this women's hoodie with jeans and leggings for a look that's 100% weekend ready. Materials: 60% cotton, 40% polyester fleece. Design Details: Rib-knit shoulder insets, cuffs, and waist. Lined drawstring hood. Graphics: Woven label. Printed graphics. Get into gear with the Performance Wicking Pullover Hoodie. Designed to help keep you cool by wicking away moisture, this women's hoodie is ideal for regulating body temp on ride day or after workouts. Convenient zip pockets for phone or keys, too. Stay Cool: Wicking properties pull moisture from body to help regulate body temperature. Materials: 100% polyester textured jersey. Rider-Friendly Features: Extended back hem for greater coverage. Pockets: Zipper kangaroo pocket and sleeve pocket. The washed-down look is definitely having a moment this season. This American Legend Pullover Sweatshirt pushes the style with on-trend details like high-low hem and extended cuffs. This women's sweatshirt kills with skinny jeans or comfy joggers. Materials: 100% cotton slub French terry with specialty wash for washed-down look. Design Details: High-low hem. Raw-edge neckline. Rib-knit cuffs and waist. Extra long cuffs can be rolled or worn long. Camo is definitely having a moment this season. 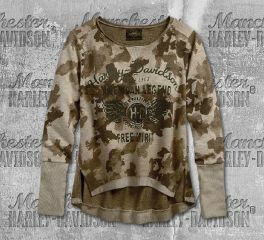 This Camo Pullover Sweatshirt pushes the style with on-trend details like high-low hem and extended cuffs. This women's sweatshirt kills with skinny jeans or comfy joggers. Graphics: Allover camo print. Printed graphics. 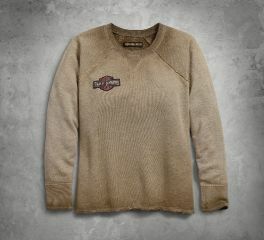 We focus extra attention on the wash of this women's sweatshirt to ensure varying color and fade for laid-back style. The Stud Logo Pullover Sweatshirt includes precision laser-cut lettering with chunky metal studs for added dimension. Materials: 100% cotton French terry. Design Details: Garment dyed with pigment spray for variations in color and fading. Rib-knit neckline, cuffs, and waist. Graphics: Laser-cut graphics with stud embellishment. Race fan? 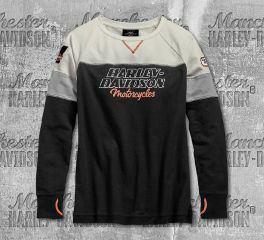 Gear up for the track in the H-D® Racing Pullover. Soft, cotton French terry construction and thumbholes help cut this chill on cool race days. Bold colorblock and sporty patches take inspiration from racing graphics. Pair this women's pullover sweatshirt with distressed jeans and flat top cap. 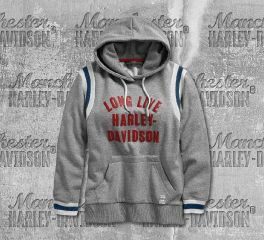 Material: 100% cotton French terry. Rider-Friendly Features: Thumbholes on cuffs. Graphics: Embroidered patches and printed graphics. The hearty felt graphics on the Studded Wing Pullover Hoodie harken back to early race days. Add a special wash for a convincing aged look. Extra width in the cuffs and waist add style to this comfy women's hoodie. Design Details: Washed for softness. Garment dyed with pigment spray for variations in color and fading. Wide rib-knit cuffs and waist. Lined drawstring hood. Graphics: Embroidered felt appliqué graphics with stud embellishment. Want to go out during cold weather? 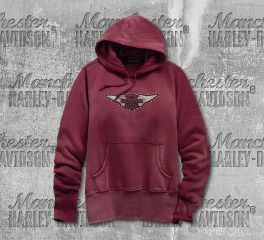 This Women's Since 1903 Pullover Hoodie is a perfect choice for you. It features a drawstring hoodie, elastic cuffs and waist, and Since 1903 graphic printed on the front. The classic Studded Raglan Pullover proudly represents vintage character. Carefully applied fabric treatments lend a well-worn vibe. Check out the perfectly faded fabric with enriched color here and there for depth of character. Bank on this one getting better with each wash and wear. Chunky studs punch up the appliqué graphics on back. The wide neckline, raw edges, and comfy raglan sleeves on this French terry women's sweatshirt definitely favor your laidback weekend plans. With its rustic raw edges and iconic jersey appliqué, the Wing Logo Raglan Pullover is all about heritage. Carefully applied fabric treatments dial up the vintage feel. You'll see it's perfectly faded in areas and enriched with color around the neck, cuffs, and hem. A gorgeous shade keeps this French terry women's sweatshirt feminine while the wide crew neck is all about casual style. 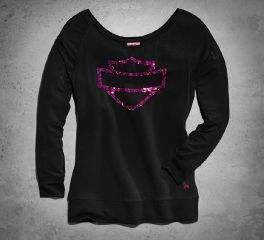 The perfect women's shirt for skinnies or leggings, the Pink Label Pullover features super soft material. Try layering our women's long sleeve top over a contrasting cami or tank. The updated shade of pink and pop of sequin bling shimmer in honor of our high-spirited lady riders.